Here at BWIB we salute, powerhouse, and Black Girl Extraordinaire, Beverly Bond. “A dynamo in true form, Beverly Bond, has blazed trails in the music, entertainment and social entrepreneurship industries. Her body of work, across sectors, has made her one of the most celebrated DJs, producers and social innovators of our time. A true music connoisseur who has solidified herself as one of the world’s premiere DJs, Bond is known for her passion and uncanny ability to read the crowd. Over the last decade, Bond, a former Wilhelmina model, has brought her versatile talents to the most highly exclusive events and to a myriad of celebrity clients including Prince, Alicia Keys, Sarah Jessica Parker, Erykah Badu, Sean “Diddy” Combs, Derrick Jeter, Jessica and Jerry Seinfeld, Jay-Z, Martha Stewart, and more. 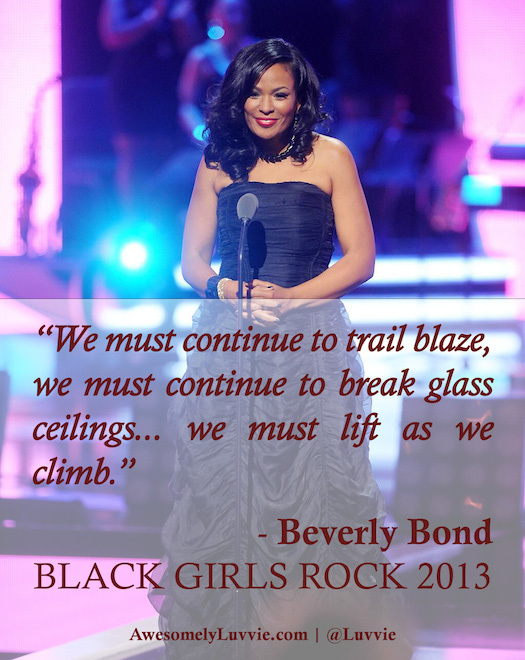 In 2006, Bond founded Black Girls Rock!, a multifaceted empowerment organization for women and girls. Providing youth enrichment programming, the organization also established the annual Black Girls Rock! Awards to celebrate exceptional women of color who stand as pillars and inspirational role models in the community. Bond partnered with BET Networks in 2010 to share her Black Girls Rock! vision with the rest of the world. As the creator and executive producer of the televised show, Bond worked with BET to craft a TV special groundbreaking in its approach to exhibiting the breadth and depth of talent celebrated by women in the African Diaspora. The premiere of the Black Girls Rock! Awards Show on BET in 2010 was magnanimous in regards to its motivational impact. It drew an impressive 2.7 million viewers and commanded the No. 1 spot on the chart for Black households. Adding to its success, the Black Girls Rock! Awards Show on BET received a 2013 NAACP Image Award for Outstanding Variety Series or Special. Bond’s work as a businesswoman, mentor, philanthropist and community leader has earned her a number of prestigious recognitions. Ebony magazine listed Bond amongst its Power 100 List from 2008-2012, marking five consecutive years that she has been recognized as one of Ebony’s Most Influential Blacks In America. Bond was also recognized as one of Essence magazine’s 40 Fierce and Fabulous Women Who are Changing the World, placing her in the company of such notables as First Lady Michelle Obama, media mogul and philanthropist Oprah Winfrey, President of the Republic of Liberia Ellen Johnson-Sirleaf, singer and actress Beyonce, actress Queen Latifah, and others. With such diverse talents combined with a fierce work ethic and a devotion to music, culture, and community development, it’s little wonder that Bond has emerged as a force in the entertainment industry and as a respected voice in the world. Beverly Bond has crafted a winning blueprint for women’s empowerment, built a dynamic career in the music industry, and created meaningful media content for television. Her work stretches far beyond ordinary boundaries and is a true testament to reaching for the stars.” Read Entire Article Here. Having just inked a five-year deal to continue broadcasting this yearly extravaganza on BET, Black Girls Rock! will continue to be that cure. Named after her Black Girls Rock! organization that elevates the spirits of girls of color on the grassroots level, it only makes sense that Bond would use her show to perform that service on the mass level. theGrio: What’s going to make this year’s edition of Black Girl’s Rock! better than ever? Beverly Bond: We have some amazing women that we’re honoring this year. Every year we try to have a diverse set of women who come from different sectors, who represent different generations, who represent different careers. We are excited this year to have incredible women like Marian Wright Edelman, but to also have Ameena Matthews, who’s a violence interrupter in Chicago. We also have Mara Brock Akil, who inspires a lot of young women to do something that’s not traditional, being a Hollywood producer, a show runner, and creator of her own TV shows at a time when we still don’t have our voices out there. Having Queen Latifah — nothing else needs to be said! And then Misty Copeland — being able to expose young girls to this ballerina who went this nontraditional route, who’s in there in this world by herself, and still fighting for the rights of other black girls, and working on the idea of trying to find the next Misty Copeland. Patti LaBelle performing in addition to being honored? That in itself is something that takes it to the next level. There are so many great things about the show this year, I think people will be glued to their TVs. Black Girls Rock! does extremely well in the ratings, beating out many other top-rated cable shows. How does it feel to know it has such great crossover appeal? Before we went to TV we had crossover appeal. A lot of the people that helped me in the beginning were not always black women. We’ve had white women, we’ve had white men, we’ve had black men. This movement is really a women’s movement. It’s really a youth empowerment movement. And it definitely is a community activists’ movement in order to help people progress and get to the next level. When you recognize any type of injustice, certainly you are going to be able to draw in people who have that humanitarian spirit, and believe in just causes. Can you speak to some of the negative messages that Black Girls Rock! is working to fight? I think that there are a lot of messages in entertainment and media that degrade women. I think that there are a lot of new messages out there through reality television that offer that fighting is a viable solution for women to resolve conflict. All of these things for grown people maybe can be looked on as fun entertainment, but these messages are being aired in time frames when children can still be exposed to them. There has to be some voice of reason or responsibility that says that this is not appropriate for kids. In addition to your show, can you describe some of the things that Black Girls Rock! does during the year in order to help young women of color? Our awards show is our annual, big event, but Black Girls Rock! is a year-round movement. We mentor girls all year round within the tri-state area. Also,we have out leadership camp. We bring girls in from all over the world. That’s a two-week intensive. This is something that we’ve been doing for the last three years, and our girls have come from as far away as Liberia, Japan, Jamaica, all across the United States, South Africa, London. So we get a great cross-section of girls from all over the world who are drawn to the message that Black Girls Rock! has put in the world. Our whole mission is about empowering the next generation, and empowering our girls to become their best selves. Understanding the importance of integrity, and excellence, and having high standards, and the choices that they make and the consequences of choices. And understanding that they are not alone, understanding the importance of service, understanding the importance of sisterhood. Those are the principles that we stand by. Our programming certainly reflects that. Read the full article from TheGRIO. Missed Black Girls Rock 2013? — Watch the full show here. As a historian the inclination to study those who took the path less trodden and succeeded against all odds has always been a source of inspiration. However, in studying countless heavy hitters and trendsetters in the Broadcast industry it was not until a random search (Thank God for Google) that I came across an interview with Belva Davis, the first black female TV journalist in the western United States. I was immediately transfixed on her story and the pathway that led her to become such an incredible trailblazer in an industry where she was continually told she should pursue other paths. Born during the Great Depression, and raised in the crowded projects of Oakland, CA. Davis shot for the stars even at a young age during disparaging times. Davis became the first in her family to graduate from high school. But she transitioned into the workforce and was married at 19, when she couldn’t come up with $300 to go to college. Not going to college was simply a detour as Davis persisted on continuing to pursue her journalistic dreams. However, Davis’ broadcasting career began in radio, where she worked at various radio stations in the Bay area, including KSAN, KDIA and KNEW. 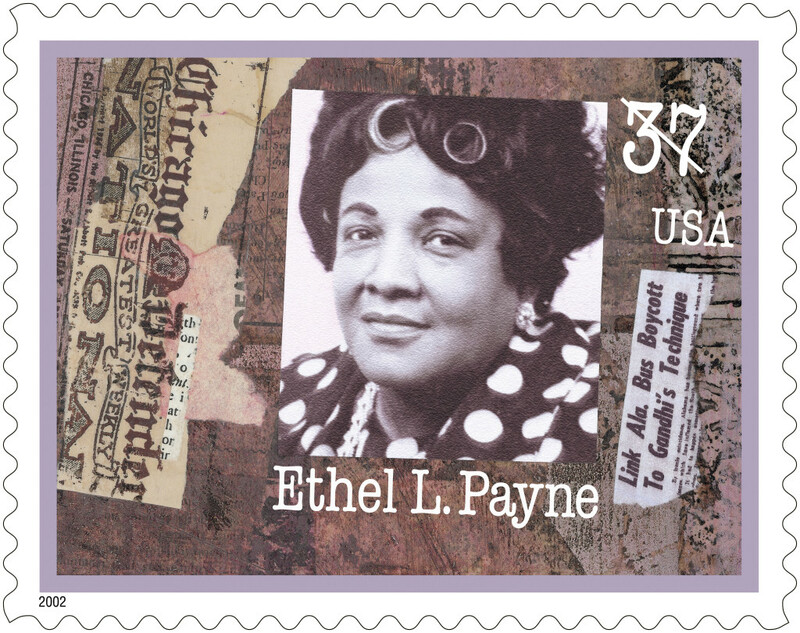 Yet, she made the leap to an integrated news market in 1966, becoming the first African-American woman television reporter on the West Coast when she was hired as a reporter at KPIX-TV in San Francisco. Davis’ career is what opened the door for a vast number of broadcasters who have continued on in her footsteps, which is why Davis is our FIRST Featured “Pioneer BWIB”. 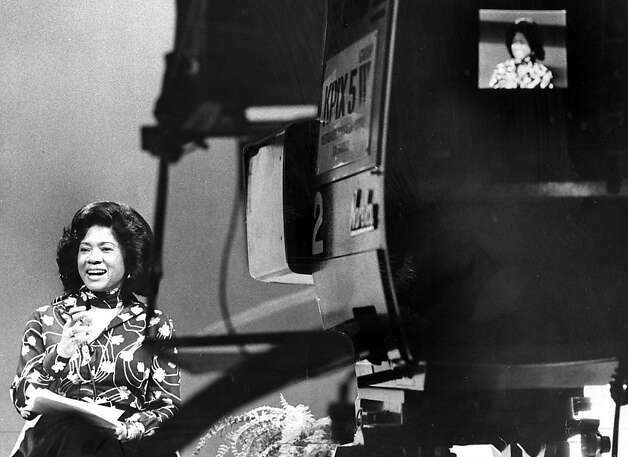 Davis, whose career spanned half a century, reported many of the most explosive stories of her era, in addition to interviewing a major assortment of cultural icons: Malcolm X, Frank Sinatra, James Brown, Bill Cosby, Huey Newton, Muhammad Ali, Alex Haley, Fidel Castro, Dianne Feinstein, Condoleezza Rice and more. Throughout her career, Davis has won eight local Emmys and a number of Lifetime Achievement awards — including honors from the International Women’s Media Foundation, the National Association of Black Journalists’, and the Northern California chapter of the National Association of Television Arts and Sciences. Davis and her achievements are also profiled in the Newseum, the world’s first interactive museum of news. In 1999, Belva Davis retired from full-time reporting at KRON-TV. Currently, Davis continues to host a weekly news roundtable and special reports at KQED, one of the nation’s leading PBS stations.